Pizza at Metropolitan Café & Pizza. Metropolitan Café & Pizza, the Rittenhouse eatery that shares a wall and a name with Metropolitan's flagship bakery, is offering diners another reason to order: free wine. 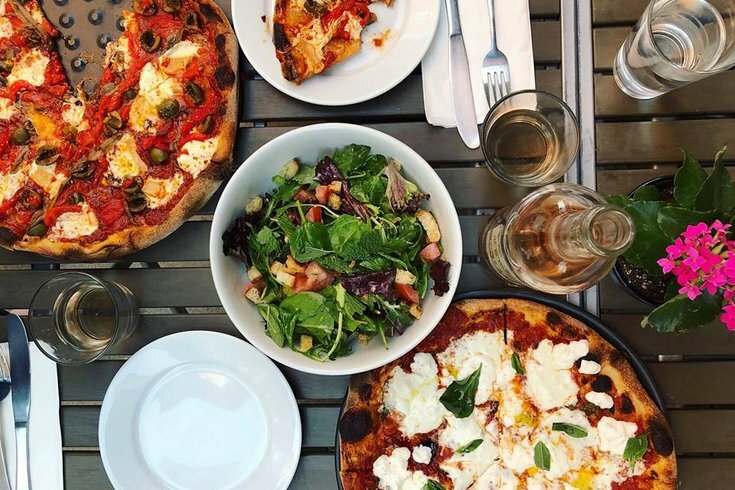 Last spring, the café unveiled a brand-new pizza menu, adding six artisanal pies and more delivery options to its already bread-centric food selection. To make the offer even more appealing, the café is now offering a BYOB alternative when you order a pizza – they bring the wine to you, free of charge. The offer applies for in-house diners who order pizza Tuesday through Thursday, between 6 and 8 p.m. You get your choice of a glass of red or white. Of course, you can still BYOB whatever kind of wine you prefer. The pizza menu includes six pies that mingle Metropolitan, Roman, and New York preparation styles. Selections include a Margherita pizza, as well as mushroom, pepperoni, sausage, farm egg, and anchovy options, which can be personalized. All pies are made in the café's newly acquired revolving deck pizza oven that came straight from Bergamo, Italy.